An Italian porphyry water feature creates a focal point for this London garden. Hardwood timber seating creates a more intimate area around the water for sitting and relaxing. Low rendered walled planters provide a simple structure within the garden with layers of grasses and perennials providing texture and movement throughout the seasons. 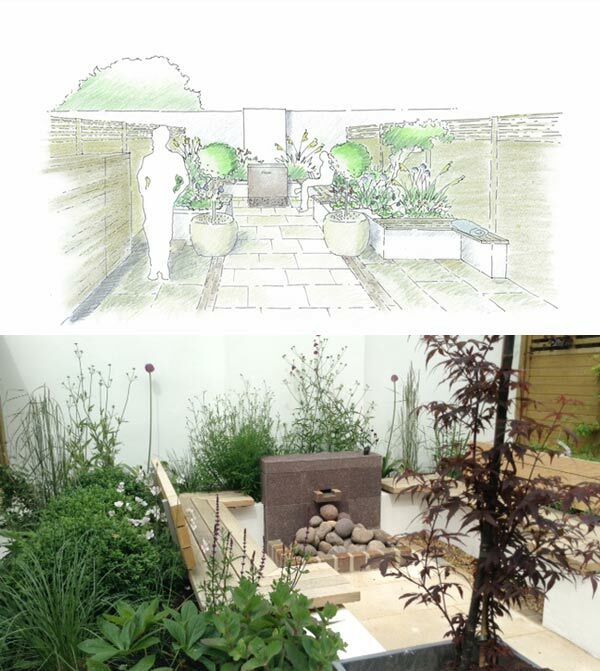 The garden uses a palette of natural stone from Stockscape with contrasting colours and textures in complementary shades of cream, browns, greys, purples, coppers and reds. Flamed sandstone setts lead the eye to the water wall, contrasting with the paler sawn limestone flags of the terrace. Purples and reds are picked up in the planting with golden sandy colours in the grasses. Space is maximised on the terrace and a timber seat catches the evening sun.